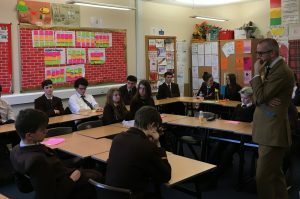 Lord Purvis of Tweed visited Jordanhill School on Friday 23 March to encourage students to become more engaged with the political and parliamentary process. Lord Purvis met Modern Studies students to talk about the work and role of the House of Lords This was followed by a question and answer session on various aspects of the parliamentary process and life at the Houses of Parliament generally. This was the second time we have hosted a Lord and both were arranged through the Lord Speaker’s “Peers in Schools” outreach programme, which was established across the UK in 2007 and has so far involved around 90,000 young people. Members of the House of Lords visit schools, academies and colleges to give talks in support of the citizenship curriculum. For further information, and to make an application, see the Lord Speaker’s web page at www.parliament.uk/lordspeaker .